This month you may have read the wonderful recommendations we’ve had from two high profile chefs and we can’t thank them enough for their kind words and support. Michael Wignall gave us a lovely little write-up in the summer edition of Exeter Life Magazine and included us as one of the places where he likes to eat. He is one of the most respected chefs in the UK and has won Michelin stars in every kitchen he has headed since being awarded his first star in 1993. 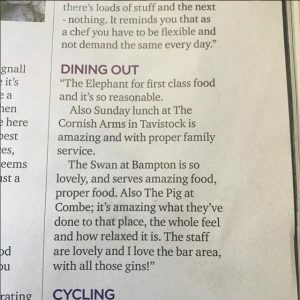 He also mentioned Simon Hulstone’s wonderful Michelin-starred Elephant Restaurant in Torquay and the 2017 Michelin bib gourmand winning, 2018 top 50 gastro pub, ranked 21, Cornish Arms in Tavistock. For us to be on the same page as these guys is very flattering indeed. We love both places, so thank you Michael that’s very kind and we really appreciate it. We also featured in the Western Morning News in a recent piece by another top-notch chef, who we very much admire, Chris Tanner. Chris and his brother James are well-known chefs and restaurateurs. Their first restaurant, Tanners, picked up a string of awards including AA restaurant of the year for England 2006/7. In the same year, the brothers expanded their business and opened, the Barbican Kitchen, in Plymouth, housed in the stunning Plymouth Gin Distillery. They then opened their award-winning gastropub, The Kentish Hare near Royal Tunbridge Wells in Kent, securing two AA rosettes just weeks after opening. The pub was also listed in the Michelin Pub Guide and was later named Newcomer of the year in the Top 50 Gastropub Awards 2016. Wow! Thank you for your mention Chris in the Western Morning News. We’re delighted you love our food!